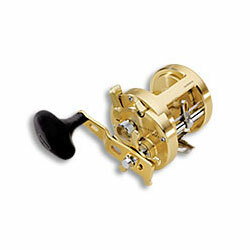 For demanding situations, the Calcutta TE 700 is the reel to have. Powerhouse construction includes a forged aluminum frame with aluminum spool and side-plates for flex-free performance under the heaviest strain. Its Super Stopper anti-reverse is supported by an exclusive Assist Stopper backup system—no give, ever—and anon-disengaging levelwind. High Efficiency Gearing, VBS centrifugal brake, Dartanium drag, audible clicker. "the TE700 can handle anything from livebaiting sailfish to inshore snook fishing with big jigs or bait.also the drag is super smooth, the other day i hooked into a 45lb wahoo offshore and the drag never jamed up and the reel had the power to bring him in"
"If your anchor winch fails this reel will save the day. It catches monster fish just as well, the power is incredible. This will haul up a 100 pound grouper off the bottom with ease, big sharks, no problem."